Commentary: This Luke Skywalker was unusual in a few ways, specifically how he was announced to the world-- as a completed, packaged sample since Hasbro actually had succeeded in manufacturing the entire wave before fans even knew it was coming. The production was seemingly held back for Toy Fair 2011, and the figures went online during the show and seemingly shipped from Hasbro days later. Well done, Hasbro. This incarnation of Luke is based on a very specific few minutes of the movie where Luke takes his helmet and gloves off, so it's based on the 2009 (or early 2010) Legacy Collection Hoth Pilot mold with a new head and new hands. Rather than resculpt the entire arm, Hasbro made new hands with most of the sleeve connected, allowing them use of more of the existing mold and keeping costs down. (Smart!) The range of motion on this one is excellent, and he reminds me a lot of the playable Luke from Super Empire Strikes Back on the Super NES. He's armed and ready to do battle with, uh, snakes or something. The lightsaber fits on his belt, the blaster fits in a newly-sculpted holster, and basically everything about it is pretty darned cool. 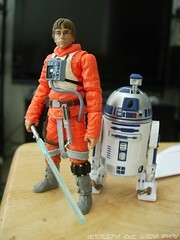 I'd also say that, in the right lighting, it's one of the best Mark Hamill likenesses we've seen from Hasbro in, uh, ever. It's really good, and the kind of plastic they used really makes it look even better. My only real criticism of the figure is that the orange plastic seems to show through the flesh-painted hands, so be careful to look at the hands when buying this figure. Collector's Notes: As a new figure you might not have seen it yet. I've seen them around, and as of today a variant has surfaced-- a dark blue lightsaber exists as well as a pale, clearer blue. The pale, clearer one was the first release. Image: Adam's pile of puzzle pieces. Collector's Notes: Since the Tank has become insanely popular on the secondary market, this one will cost you. The price is on a downaward trend right now, so if you're lucky you can get a boxed one for $175 or so, or a loose one under $100. They were above $200 late in 2010, so keep an eye on the market if you want to save some money. Commentary: It's unusual that Hasbro makes a figure based off a cast member, but the Star Tours Officer is, basically, that. It looks vaguely like the people dressed up at the ride, made with the limitations imposed by repainting the 2001 Imperial Officer mold. Since it's based on an old design, you'll note that it doesn't have ball-jointed elbows, as those weren't used in the line very much at that time. (Or at all, actually.) The figure has the basic 6 points of articulation common to most of the figures, plus swivel gloves and biceps for added movement. He can stand and sit, which would be fantastic had Hasbro produced an adequately sized Starspeeder for him to sit in-- which, I believe I've heard, is coming in conjunction with the new ride. The bright orange deco is peppered with some blue, plus a tampo on his left shoulder which resembles the Star Tours logo. It's such a weird figure that I have to advise you to get it. The Star Tours stuff is delightfully weird, and as such, is totally worth shelling out for. Collector's Notes: This set is still available at most Disney parks if you want it, and I believe you do. It also includes Teek, Kaink, Chewbacca, and Ree-Yees. Commentary: Repackaged a few times, slightly redecorated and retooled, and also completely overhauled, this first Anakin Skywalker is at just barely three years old, already something of a relic. When he was released, the Clone Wars lineup was squarely aimed at kids with main characters, action features, and good--but limited-- articulation. 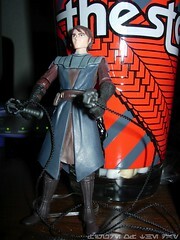 Anakin here doesn't have knee or ankle joints, but he is otherwise as fully-articulated as one might hope. He can sit, but his lower robes aren't too flexible so they may get in the way of putting him in certain vehicles. The most interesting thing about this (and other) figures from the early days of this line was the abundance of accessories. Not only do you get a lightsaber, but there's a firing Force-Blast, plus a rope for him to swing down on or fly along or whatever. When there are more accessories than the figure has hands, I'm generally impressed-- so as a toy, this figure offers a lot of play value to kids but the average collector would probably prefer the space helmet version of Anakin which came later, due to its improved sculpt and added articulation. Collector's Notes: This figure shipped on and off for a while, so he's really easy to get. He was also retooled, repackaged, and effectively thrust upon the market-- if you collected the cartoon line, you probably have one, two, or as many as a half dozen figures based on this one's mold. Collector's Notes: This assortment stuck around for a while, and while unlikely it's possible you might still be able to find it locally. At $13 it may be a bit of a stretch, but for $10 or less it's a great deal. On eBay, it's not worth a lot so feel free to be a cheapskate on this one. 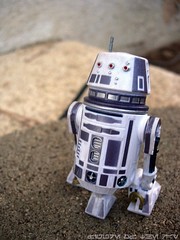 Image: On a 2010 Freeco Speeder backdrop. Nice, eh? Commentary: There are two fascinating things about this Snowtrooper: one, that its accessories are far better than its cost warranted, and two, it was made from an inferior grade of white plastic. (See Collector's Notes for more on the latter.) This figure was also notable for not being a "trooper" so much as a ranking officer, on the upper left-hand part of his chest armor are some colored squares that says he's smarter than the average grunt. 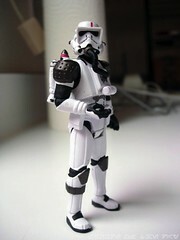 Shorter than the hulking 1997 Snowtrooper, this version really did pack a lot of fun into a cheap package. 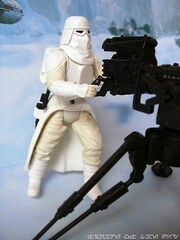 The head could turn (a first for a 3 3/4-inch Snowtrooper), he had a holster for his blaster, and he had added ankle articulation to help with improving his poses in battle scenes. The detail is really nice, with some crinkles in the mask and a nice, smooth helmet. There isn't a lot of dirt-- which is nice, given the snow-- and while the articulation isn't as good as later figures, it's not bad at 7 points. The helmet's ability to pivot forward and backward is a nice touch, but the real winner here is the E-Web Cannon. 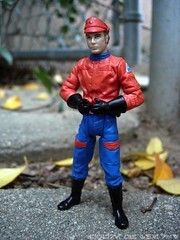 In the vintage line, it was a separate accessory-- in 1997, it was a deluxe figure's accessory. And now? Basic figure. How cool is that? It fires a rocket and has pretty good detail, but lacks the cable and ammo box of the previous two releases. So while not perfect, it certainly was cheap and you absolutely got your money's worth. For those keeping track of such things, the accessories Hasbro packed in with figures from 2002-2004 were, on the whole, some of the best of the entire run. And when I say "entire run" I mean everything from 1978-2011, they really crammed some awesome gear in some of those figures. Sure we got a few good ones in 2006, but nothing quite this nice. 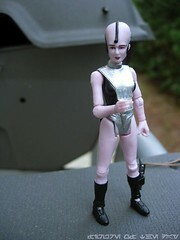 Collector's Notes: This figure was made during a time where Hasbro's white plastic often grew a green film over time. This happens to packaged and opened figures, and can be removed off the figure if you rub it with a cloth, damp or otherwise. It's extremely difficult to get into the nooks and crannies. If you can get the green out of the nooks of his backpack, you're a genius. This particular affliction is pretty common on figures made of mostly white plastic from 2002-2004, which effectively encompasses the entire Attack of the Clones/Saga blue carded action figure line as well as some 2003 Clone Wars figures. If you haven't seen your 2002-2004 figures lately, you might want to go check them out-- even if properly cared for in a dark, cool place, the figures will grow this green grease that has to be removed physically. This particular Snowtrooper mold was reused quite a bit, so don't be surprised if you see a few flavors of it in your collection. Image: My kitchen, on a G.I. Joe diorama box. I spare no expense. The figure itself is fairly ornate-- the face paint is good, and the scarf is sculpted as part of the head. 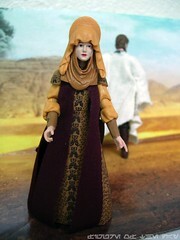 The yellow headdress is removable, and a second one has been included as well. Her arms are fully jointed, and from the waist down she's basically a pepper shaker with no meaningful movement. Hasbro did sculpt legs and pants underneath, though, so that's good. The gown is covered in fine detail, with sculpted and painted accents bringing the fabric to life. To add more heft to the figure, they even included some cloth elements to make her appear slightly less stiff. All in all, a great job on a figure you probably didn't want to buy. It's nice to see this kind of effort go into a figure like this, not just because I appreciate quality but because it also means Hasbro will probably never have a reason to revisit this figure in this costume. She even has a gun, although I don't suppose you'll need it. Collector's Notes: Like the rest of the figures from her wave, she's packed at 1-per-box. So far, it seems she sells fairly quickly so there's no real danger of her becoming a pegwarmer at this time. 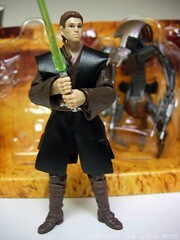 Commentary: A retooled version of the 2005 Evolutions Anakin Skywalker, this revised Attack of the Clones version makes a few notable changes-- the first of which is a new head sculpt. The previous one looked a little off, and this one does too. It's better, but Hayden Christensen's head is a tough one to pull off correctly. The colors of his robes were changed up, with the cloth elements seeming darker than the last go-round. 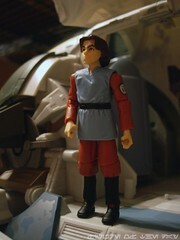 Thankfully, the figure still has cloth rather than plastic making up his robes, so he should have no problems piloting vehicles or sitting down. As you can see in the image he has no difficulty holding a lightsaber either, and this time around he comes with a green blade one-- like the one he gets tossed after he's untied in the arena. If you have the Evolutions figure (which was also sold in the tins and elsewhere) this may be a worthy upgrade. I see new head sculpts as being worth the effort to track down, so this one I'd say you should get. His companion figure, the Droideka, does not seem significantly different from any of the other releases. Collector's Notes: These sets seemed to perform quite well, so they should be gone from retail in most parts of the country by now-- long gone, really. The first batch of Arena packs from 2009 stuck around for a while, so it's nice to see this set either had a smaller run or simply performed better. Commentary: This particular Boba Fett is exclusive to the boxed set, which also includes 2 vehicles and 4 more figures. Even more surprisingly, it seems to be selling well, having sold through in numerous markets despite a high price tag. While not as decked out as his individually carded counterpart, this completely different sculpt is modeled after the Clone Cadet outfit, meaning that as of yet he's the only Clone Cadet action figure. While super-articulated, the shirt hangs down below the waist, blocking the hips from moving too much. The hands are sculpted nicely, but no guns were included for him to use in this set. You'll like this figure, I don't doubt, but I wouldn't suggest buying the set just for him-- for the vehicles, sure. For Bossk? Maybe. But not just for Boba, just because it wouldn't stun me to see a Clone Cadet sold elsewhere in the future and you could probably do a head swap with a different Boba Fett figure. Collector's Notes: You'll want the Slave I anyway, so get this set if you can. As of now there are no known plans to sell this figure individually, but another carded version of animated Boba Fett exists. The set seems to still be available in most markets, and the sum of its parts are arguably worth it. Commentary: If at first you don't succeed, try, try again, and then sell it in a boxed set. 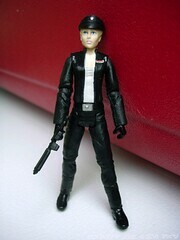 Fans immediately took notice in 2008 when the Juno Eclipse action figure's outfit didn't quite match the design in the game, and Hasbro was hard at work on more figures based on the adventures from the Xbox, Playstation, and Wii. That wave ended up becoming boxed sets, and Juno did indeed get a retooled torso with an open jacket-- you can see it in the picture, obviously. Aside from the torso the figure is largely the same as the 2008 release, except she can sit much more easily now that the "skirt" piece of her jacket is no longer necessary. The opened jacket has the added benefit of having a specific rank badge, so she more or less matches the game's art. I don't have a whole heck of a lot to say other than "like the original release, but improved." I suppose they could do her with a new head sculpt again some day, but at this scale I don't expect to see much improvement-- this should be about as good as she gets. Collector's Notes: At press time it seems the sets are sold through, so if you see it, grab it. Commentary: As one of two new Battle Droid figures to debut in the Arena collection at Target, it's worth noting that both had wonderful sculpts and engineering with terrible deco. Articulation is good, but if you paint a figure badly it's almost worse than not having any arm joints. Thankfully this figure wasn't totally ruined, but Hasbro did forget to give him eyes. Rather than sculpt a place for eyes to go, they were just left painted on and for some reason the factory left them off. (On the companion Commander figure, the eyes were oversized.) 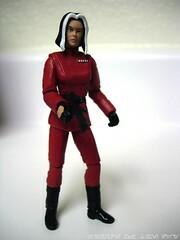 The red plastic looked good, as did the black wash to bring out the detail in the figure. But the eyes! You can't forget to add the eyes. As to the sculpt? Excellent. You get a figure that can really collapse into a little huddled-up ball, and he has ankle joints plus a telescoping neck. The hip joints have limited lateral movement (an upgrade from "none") and the arms are designed so they can also go in and out a little bit. 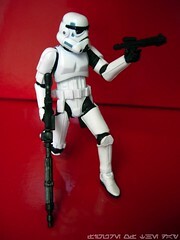 There are no swiveling elbows here, but the figure can still be positioned with both hands on his gun if you really try. Hasbro did a great job designing the figure, but there's just not getting past the fact that 100% of the Target Exclusive run had no eyes. That's just a bizarre thing and I guess the kind of thing you'll only see in a line that has passed 1,000 action figures... statistically, it's bound to happen eventually. 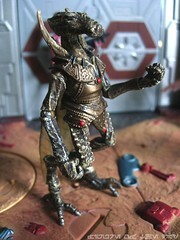 Collector's Notes: This figure (as well as a version with corrected eyes) appeared in Saga Legends in 2010 and 2011. Even more amazing, he's packaged with the commander in a set, which is a really remarkable deal. Commentary: In 2009 it became painfully apparent that some combination of Hasbro and retailer support was going to lead to the end of the comic pack line-- several were tooled up, but never made it out. In late 2010, they found a home at Entertainment Earth bringing figures like Ysanne Isard to the fans. While they weren't instant sell-outs, they did turn out pretty well and it's nice to see these items see production at all. Isard is a simple repaint with a new head, but it works really well. The body is that of Juno Eclipse/Deena Shan, but painted in red and topped off with an entirely new head sculpt that brings you her white bangs and red eye. While not typically shown wearing gloves, well, it's not like it's a bad thing for someone to be wearing, I suppose. The recycled rank badge is also not exactly perfect, but, again, that's the nature of the beast when getting some of these increasingly obscure characters-- recycle parts, or get nothing at all. She can stand and look good, but sitting is a little difficult due to her lower coat piece. That's really just fine, because it's not like she's known for flying a ship and there aren't many playsets for her to sit at in the first place. While the figure has a couple of minor changes from the artwork, it's still a great figure-- the head is good, the color is right, and she looks appropriately mean. When it comes to the director of Imperial Intelligence, you're going to want mean. Collector's Notes: The figure was "canceled" as a mainline item and eventually ended up online as an exclusive. As such, order online, or from a collector-friendly store that buys products from EE Distribution if you want this one. Or wait. Image: My kitchen, on some red box I found. Commentary: By mixing and matching various parts, this Stormtrooper has amazing articulation and can actually kneel down to be a sort of a sniper. His legs are taken from the 2009 Dewback (and 2010 Vintage) Sandtrooper, while the rest of him is largely derived from the 2007 30th Anniversary Collection Stormtrooper, right down to the removable helmet. I've heard reports of the figure's bucket falling off his head, but my sample tends to stay on just fine-- maybe I got lucky. While not necessarily a figure you'll want to pay out to army build, it's absolutely worth getting a few of these to add to your ranks just to add some variety to the weaponry and the poses these figures can make. The longer rifle is rarely packaged with a Stormtrooper, so seeing it included here was a really nice touch. The deco is good, but not perfect-- for example, there are some added grey paint apps on his shoes that we rarely see on these figures, but the little grey dots on his torso were not painted-- so it's both a step forward and a step... well, sideways. I don't think anyone really misses the belly dots. He has no problems standing or sitting, but it's worth noting that the belt is loose. Not "it's going to fall off" loose but "it easily swivels around the figure's waist" loose. The blaster can be crammed into a holster, although it's not really a good fit-- despite being sculpted to fit the gun, it hangs out sort of funny. If you're looking to add some action to your dioramas, this is a good one to get-- it's just kinda expensive. Collector's Notes: For whatever reason, Hasbro decided to include this one on an Empire Strikes Back card like the 2004 release, rather than give it a spin on Star Wars or Return of the Jedi. Hopefully we'll see them decide to mix up the logos to make things interesting for carded collectors, but I'm not too hopeful. And hey, if you like the column and still need this (or other) figures, go ahead and click on the link below-- it helps us out and we get a little something from each sale! Commentary: When you can't do something original, at least try to do something different. Hasbro succeeds in giving us something different with Dengar sporting dual shades of purple, much like the character had in his comic book appearances. The body is the 2004 mold which, for the time, was great. Heck, if Hasbro didn't do a new one in 2010, it'd still be great. The figure's face paint on the samples I've seen are mostly quite good, and the purple is just, well, a little weird. For those of you who like weird repaints of vinyl figures or Funko's many pop art-themed exclusive packs, the Marvel Hasbro Star Wars comic pack figures are probably right up your alley. There's not a lot of articulation to be had, but ball-jointed shoulders, swivel elbows, swivel wrists, and hips make him much more than a simple statue. The colors work well with the sculpt, although it's often odd to see a figure with an incredible, realistic sculpt be given a paint job out of a Filmation TV pilot. If you love the weird, and I do, you should get this. Collector's Notes: This figure was sold with Fenn Shysa, a character who also had multiple weird recolors of his armor in the Marvel comic series. 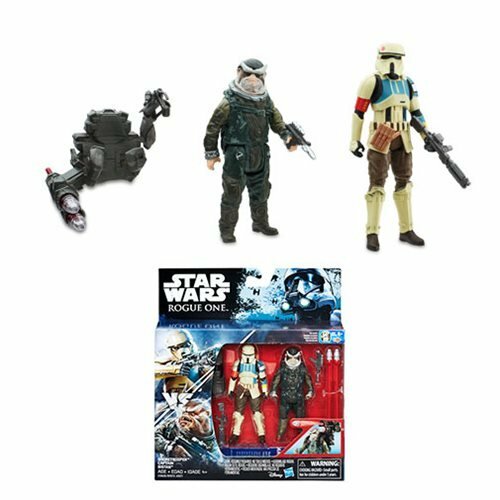 Because Fenn is so cool and Dengar is so weird, this is a set I'd suggest tracking down if the price is right. The current price is about $5-$13, and at those rates this set is an incredible value. Commentary: Kmart's second single-carded exclusive of its own inside a year-- and if memory serves, ever-- Captain Lock is more than a simple repaint. Not a lot more, mind you, but Hasbro has been mixing, matching, and making new parts for its Clone molds so we're starting to see some new elements added to older molds-- like this one. The body is essentially the 2008 animated Commander Cody body, complete with antenna shoulder pad and the always popular bend-and-swivel wrist joints which are just perfect for aiming guns. He retains the old elbow armor (a minor detail), but has an all-new helmet. Unlike the other figures, the head isn't removable (unusual) and it has a flesh painted neck so many fans actually expected this one to have a face under the mask. Aside from the fact that the elbows don't quite match the show, the figure's deco is pretty much on the mark. The dark green with brown and light yellowish green highlights match the stills I've seen fairly well, aside from the fact he seems to have more wear-and-tear on the animation model. 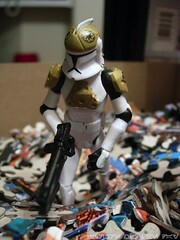 I like it clean, though, and the figure is pretty cool and distinctive from many of the other troopers. Speaking of troopers, the members of his squad have yet to be released but I assume they'll get to them eventually. Collector's Notes: Some notables about this one: he was a Kmart exclusive, and one of very few times Kmart got a new character as an exclusive. He was released before Hasbro announced him, as in February of 2011 they said he would be coming out in the spring-- I was at the presentation and already bought him at retail. He's also fairly obscure, with many fans not knowing who he is. 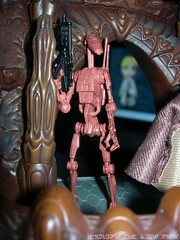 He appeared in "Grievous Intrigue" in season 2 of The Clone Wars. Commentary: In 2010, Hasbro decided to rerelease and revise a number of its Force Unleashed toys at Toys "R" Us for an exclusive boxed set. 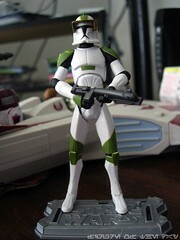 Some were just minor deco changes, but Hasbro did a good job updating the Imperial Jumptrooper. For starters, it finally has its backpack! 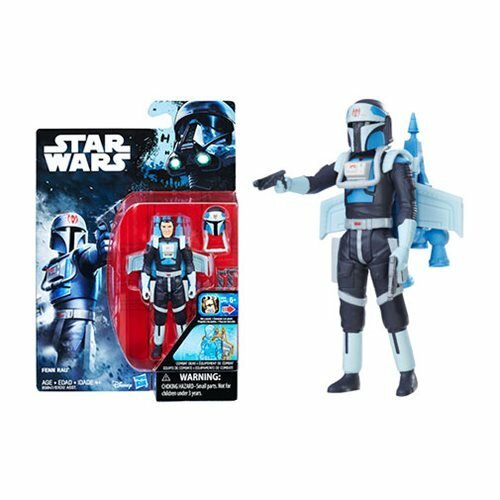 The back was retooled and Hasbro made use of a redesigned jetpack similar to what Jango wore, so good call on their part. Check out the big red button and detail when you get yours-- you'll be impressed! Since it's an exclusive refresh, there aren't a lot of major changes beyond that-- you still get 14 points of articulation, and he can still hold onto his weapons fairly well. The figure is essentially the same basic design from 2009, except now the reds are redder, the whites are whiter, and there's no dirt on the feet-- really, it looks better overall. 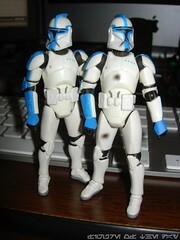 The basic "enhanced Stormtrooper" design still comes through, and this is easily the better of the two Jumptrooper toys. Improved deco and more gear does wonders to make a good figure even better, so be sure to get this set-- and this figure-- if you're in the market for Force Unleashed toys. Collector's Notes: The set is basically done shipping, but old stock from the back room keeps popping up around some US Toys "R" Us stores. For $30, this is a fantastic set-- be sure to get it if you see it. More than that, well, that's up to you-- but 5 figures for $30 is a great deal in this era of increasingly expensive toys. Image: My former apartment's back yard. Commentary: My definition of obscure as it relates to this toy line generally comes from "do you remember the name of the figure?" and "did you know who this was before it got a toy?" If the answer is no, you can say that a figure like R5-C7 qualifies as being somewhat obscure. When I first saw it, I thought it looked similar to a robot in a still from a Rebel briefing, and obviously that wasn't the origin. All fans really have to match this guy against is an image on Wookieepedia, as you probably never saw it in the actual film. The shade of purple is a little darker than the photograph, and while close the color distribution feels just a little different. It's not bad, and I don't think it needs to be redone because I can't imagine anyone is genuinely put off by the fact that the color might not match the exact palette as seen on film. The red eyes in the silver sockets look really great, and there's just a little bit of a dirt wash on this figure to bring out a little more personality. He's almost squeaky-clean and doesn't really feel like a Tatooine native, but it's cool and I dig it. The red eyes are, to me, the selling point. There are lots of robots out there, but few in quite these colors. If you have the means, get one. Collector's Notes: This figure came with some of the slower sellers of late 2009, many of which sat around until 2010 and beyond in some stores. A completed figure sells for about $10 on his own, but I would suggest tracking down the figures that make up this wave. Giran is an awesome, awesome toy. 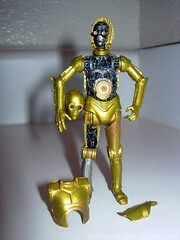 Commentary: Love it or hate it, there's no denying that this C-3PO is an incredibly interesting action figure. Dropping the vac-metal gold we've seen on most of the movie-based figures, this metallic gold protocol droid has a completely original sculpt that was, according to Hasbro, sculpted through mostly digital means. He's also super-articulated, which is unusual for C-3PO, and features numerous removable panels including one on his back that most people don't even realize is there. These panels do tend to pop off fairly easily, which means this is more of a figure for display than play. It's really cool to see all the wire detail, as this figure is clearly inspired by the prequel designs and delivers a unique, if not particularly "vintage"y action figure experience. 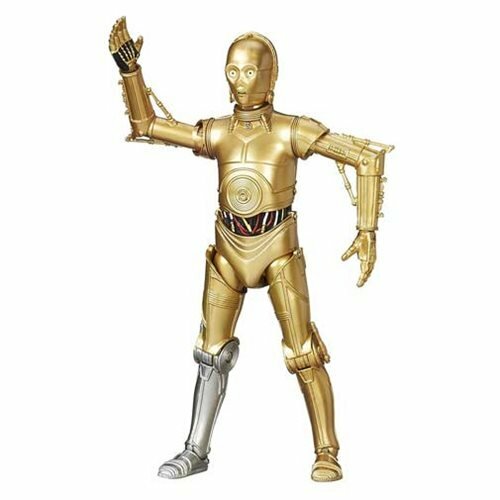 While a little shorter than other C-3PO toys, this one is supposedly better in-scale with other figures including the new R2-D2, so you might want to get one (or more) for displays. As a toy, it's merely OK. Hasbro adding in removable parts doesn't necessarily make it more fun overall, it's a nice plaything to mess with on its own but when you start putting it in vehicles you might accidentally knock part of his body loose, and that's arguably not a great play feature. (Maybe you like it, this is obviously something I don't know.) In the packaging it just looks spectacular, so I'd have a hard time not insisting that you go buy one of these. It's pretty great! Collector's Notes: This figure seems to be a slower seller, but that's OK-- it means you should buy it next time it's on sale for less than eight bucks. Trust me, it's cool enough to be worth a look. Image: My kitchen, on some tray. Commentary: There aren't many different ways to do a movie Darth Maul, although "with the hood up" is one such variation. 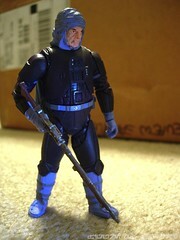 This figure effectively recycled the idea behind the previous Sith Speeder Maul (now available as a Saga Legends toy) but with a new head, it has a slightly different personality. It still has great articulation for its time, but with a covered-up head it's just a little more menacing. 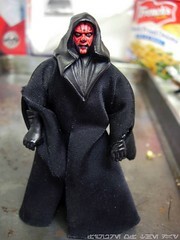 While not the best version of a hood-up Maul, it's currently the best in terms of articulation and the range of motion-- Habsro's decision to use cloth and not restrict hip or knee joints makes a big difference in terms of a figure being a quality plaything, and not just a nice looking statue. The vehicle itself is, if you ask me, the real reason to pick this one up. It has these cool flip-out cannons and has neat shoulder harness things that fold down and help keep Maul in place. It may not be authentic to the film but as a toy, the Sith Attack Speeder with Darth Maul is absolutely worthy of reissuing. It's a nice piece that most fans probably passed up on the first go-round. Collector's Notes: This set was more common on closeout shelves than it was at full price. As an original design, this Mini-Rig vehicle is pretty cool but it didn't exactly turn in to a huge hit. It's worth $5-$10 today, and I'd say it's worth that price. Commentary: I define Leesub Sirln as "too obscure." Why? Fans didn't ask for her, you can't find her in the movie easily, and in the 1990s when she got a trading card made of her, everybody I asked told me they were pretty sure it was an airbrushed original design created just for Decipher's Premiere Edition of the Customizable Card Game. THAT, my friends, is obscure. When you have a Cantina alien that fans shrug at, that's a pretty remarkable feat. Considering the lack of reference material, I can only guess that this figure is pretty authentic. The coloring may be slightly off, but the reference pictures I've found seem to indicate that her short shorts-- and they're plenty short-- are indeed accurate. She can stand and sit, plus she has a gun in her boot. It's a nice figure, but kids aren't interest in girls with booze and hot pants. Based on sales, neither are collectors. (A shame, I could go for more of that.) She's a great addition to any Cantina diorama if you need more figures, but at this stage in the game you probably don't. Her big pink head and silver outfit are very retro but don't necessarily fit in with the "Star Wars look" we've all become used to a few films later-- but she fits right in with the interpretation of the film as seen in the 1970s. If you can get her cheap you might as well, but the problem with figures like her is that she's quite good but ultimately a figure people didn't seem to want. Collector's Notes: This figure was a poor seller. There's such a thing as "too obscure" and this is it-- figures were left unsold after Legacy ended. I picked up a spare of her for about fifty cents. eBay seems to agree with that price.